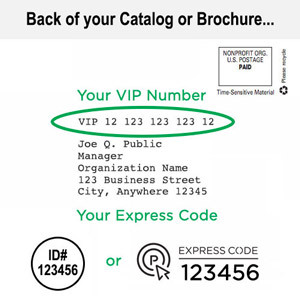 Set measurable, meaningful performance expectations. Avoid the time crunch and paper blizzard that often accompany performance evaluations. Provide an objective, accurate assessment that clearly highlights areas for improvement. Overcome the evaluation fear factor and create a dynamic, productive process. Navigate the tricky relationship of raises and performance. Raise the bar for employees who are already productive and turn things around for struggling staff members. Follow through after the evaluation to ensure progress continuesvand agreements are kept. Cover difficult evaluation topics without incurring anger. 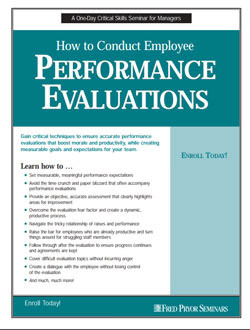 Create a dialogue with the employee without losing control of the evaluation. Evaluations are a paperwork nightmare. They take too much time away from critical tasks. I’ve never been trained on how to give a review. I’m afraid I’ll blow it. I don’t want to hurt employees’ feelings, so I go soft, but I may not be getting through, which in the long run could hurt them more. Things actually seem worse in our department after evaluations. We’d be better off without them. Employees expect a raise when they’re evaluated, but our company isn’t giving them. How can I keep staff motivated without raises? Our evaluations are always late, and they don’t really say much. I feel like I’m under attack in reviews, and the appraisal is so one-sided. I want to have my views considered in the process too. When it comes to reviews, you’re only as good as your last project. All the good work I did early in the review period is forgotten. My manager brought up stuff I’d never heard about before. How fair is that? No raise? This review doesn’t mean much, if there’s no reward to go with it. Can an evaluation ever be successfully delivered online or by phone? The differences between a traditional and a developmental approach to performance evaluation - which is better for your team?